Jakub Straka and Michael S. Engel of Charles University in Prague and the University of Kansas have formed another "expedition" to the islands and found that all was not what it seemed. While some larger cuckoo bees were Mediterranean/Asian, these four new bee species were endemic to the islands and, even with their small stature, had a typical case of island gigantism. This is one of the island effects of the geographical isolation of a species. Cuckoo bees quietly find their way into the hives of other bees and arrange the rearing of their brood. The cuckoo itself could hardly be more successful, but the species rarely invade any but their own parasitized hosts, as the consequences could be fatal! All 4 Thyreus species seem related, so a single invasion is the most likely colonisation event. 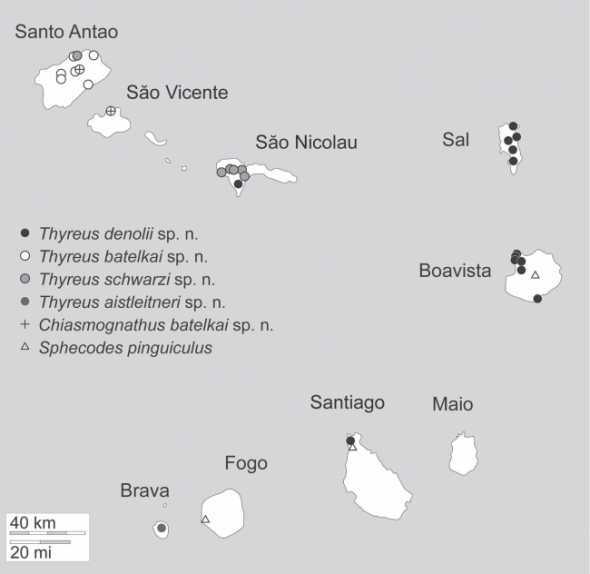 The Canaries have a related species and inter-island breeding may have been more likely as sea levels lowered between the shallow pieces of water between some of the islands. And the next step? The authors of this ZooKeys published research article intend to examine the more normal Apids (bees) of the islands as the island effect is quite pronounced here. Other researchers would do well to have a look at other animals and plants.